Cucumbers have a crisp, refreshing quality because of their very high water content. Cucumbers that you see at your local market are likely to be one of two types: pickling cucumbers or slicing cucumbers. Pickling cucumbers are bitter when raw and commonly used to make pickles. These types of cucumbers include cornichon, dill, and gherkin. Slicing cucumbers, on the other hand, include varieties such as the seedless English (or hothouse), lemon, and common green market cucumber. Regardless of the type you choose, cucumbers can be a nutritious low-calorie addition to your diet. One half cup of cucumbers contains only eight calories and 1.9 grams of carbohydrates, making them a very low calorie and low carbohydrate food choice. The estimated glycemic load of cucumbers is one for a half-cup serving. There is almost no fat in cucumbers. Cucumbers are not a good source of protein, providing less than one gram per serving. Cucumbers are a good source of vitamin K.
Cucumber (with the skin) provides health benefits because of the vitamin K it contains. A single serving provides about nine percent of your daily needs. Vitamin K is a fat soluble vitamin that assists in blood clotting. For those people on Coumadin, it's important to keep your intake of vitamin K consistent. 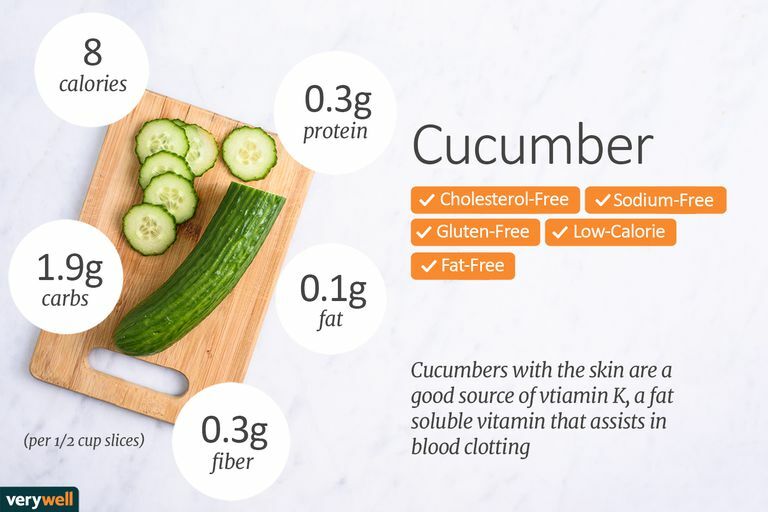 Cucumbers are also a good low-calorie and low-carbohydrate food to include in your diet if you are trying to reduce your wait or improve your eating habits. You can replace crackers and bread with cucumber slices or hollowed out cucumber boats to reduce your intake of refined grains and possible salt. Do pickles and cucumbers have the the same nutrition facts? Calories in pickles and calories in cucumber are usually about the same. According to the US Department of Agriculture National Nutrient Database, one large pickle (about four inches long) contains roughly: 16 calories, 0.4 grams fat, 3.25 grams carbohydrate, 1.4 grams fiber, 1.4 grams sugar, 0.7 g protein, and 1092 mg sodium. Pickles are a very low calorie food, however, they contain nearly half of the amount of sodium we should eat in a day. If you are looking to follow a low sodium diet or are salt sensitive and have a history of high blood pressure, eating pickles is probably not the best food choice. Excess sodium intake can increase blood pressure by causing the body to retain water, which puts stress and pressure on your heart and blood vessels. When are cucumbers in season? Common varieties of cucumbers are available year long with peak season from April to October. Do all cucumbers have seeds? Some cucumbers contain seeds while others do not. How do I choose the best cucumber? Choose cucumbers that are firm but not hard. Skip out on cucumbers that are limp, have soft spots, or appear yellow. How should I store cucumbers? Although most people store cucumbers in the refrigerator, many chefs suggest storing them outside the refrigerator because cold temperatures can accelerate decay and cause pitting or water soaked areas. If cucumbers are stored in the refrigerator, it should be for no more than a few days, and they should be placed towards the front of the shelf where temperatures tend to be warmer. Cucumbers are sensitive to ethylene, a natural gas that causes certain foods to ripen. If you keep your cucumbers on the counter, keep them away from bananas, tomatoes, and melons, which are high ethylene producers. Cucumbers can be sliced for use in salads, as crudités to dip into spreads, or mixed with yogurt and dill or mint as a side dish, especially for spicy dishes. Cucumbers can also be mixed with other fruits such as melon to make cold, refreshing soups. Lastly, make cucumber water to break up the monotony of regular iced water. Start your day by hydrating your body with a refreshing glass of cucumber water, or slice up some cucumbers to add to your salad or dip into your hummus as a filling snack. Shred some cucumbers to use to make an all-time Greek favorite, tzatziki, which you can serve as an appetizer for dipping or as a protein topper for a calcium and protein packed meal. Lastly, use your cucumber as a "cup" for protein. Scoop out the middle and replace it with your favorite salad. If you have oral allergy syndrome (OAS) you may experience a reaction when you consume cucumbers. According to the American Academy of Allergy, Asthma, and Immunology the syndrome is also known as pollen-food syndrome and is caused by cross-reacting allergens found in both pollen and raw fruits, vegetables, or some tree nuts. The American College of Allergy, Asthma, and Immunology also notes that people with a known allergy to ragweed pollen may also experience symptoms when consuming banana, cucumber, melons, sunflower seeds, zucchini. Symptoms may include itchy mouth, ears or throat, or swelling of the lips, mouth, tongue, and throat. If you suspect an allergy to cucumber, seek the advice of a qualified healthcare professional. Labensky, SR, Hause, AM. On Cooking: A Textbook of Culinary Fundamentals. 3rd ed. Upper Sadle River, NJ: Prentice Hall, 2003: 625.